ATTEND KEYNOTES & AND MEET THE SPEAKERS AS WELL. Conferences & workshops are held alongside your business meetings and are included in your meeting schedule depending on your requests. Large-scale synchrotron and neutron research infrastructures offer novel opportunities for the advanced characterisation of micro- and nano-electronic devices. These non-conventional techniques are complementary to the more established lab-based nano-characterisation today in use (mainly transmission electron microscopy), and the combination of the two approach can result in a valuable return in solving industrial problems. In this perspective, the IRT Nanoelec Advanced Characterisation Platform has been established out of a partnership between the European Synchrotron (ESRF), the Institut Laue Langevin (ILL) and Platform for Nano-Characterisation (PFNC) of the CEA in Grenoble. These institutes respectively provide world-leading synchrotron light, neutron facilities and high standard lab based nano-characterisation services. In order to demonstrate the importance of the characterisation offered for the nano-electronics industry, an overview of the following techniques will be presented: a) micro/nano-tomography analysis, b) scanning nano-focused diffraction mapping, c) X-ray diffraction imaging, d) neutron reflectivity, e) neutron irradiation for single event effect characterisation. Furthermore, a description of two new industry-tailored facilities at the ESRF will be provided. Particular emphasis will be given to the opportunities for future developments, coherent with the electronics technology roadmaps and current main trends. Today the production (assembly, control ...) of miniaturized objects is a major topic of the industry. Indeed, the number of possible references for the same product becomes more and more important and this goes with a reduction in the production batches for each variant. Flexibility is therefore a major theme for all types of assemblies and even more so in the micro-technical industry where the development of small bulk parts is a real challenge with traditional solutions. To control manufacturing costs and increase their competitiveness, industrialists must therefore use appropriate means of production. This leads to a continuous growth of automation and invites to seek highly flexible solutions rather than dedicated to a particular task. Parts are usually supplied in bulk in automation solutions to minimize the costs of eventual packaging. However, it is often macroscopic processes that are involved, which do not necessarily meet the expectations of the microtechnology industry. The Asycube solution, developed by asyril, allows to process in bulk very small parts (lower in size to tenth of millimeters) and up to pieces of 40mm. 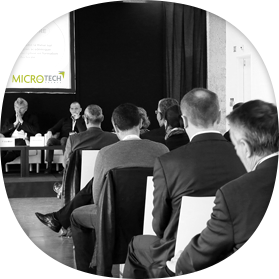 This key-note will present concrete examples of applications in microtechnology and will show the important advantages that flexible management solutions can provide in microtechnics. The process presented is based on chemical vapor deposition assisted by cold plasma at atmospheric pressure in order to avoid the specific costs associated with the use of vacuum. The innovative idea consists in decoupling the plasma from the injection of precursor gas. Thus, the resolution of the pattern produced depends solely on the diameter of the injection capillary and not on the size of the plasma. It is thus possible to deposit metal or polymers on various substrates, but also to etch the substrate. Thanks to a technology borrowed from medicine it is possible to make capillaries with a minimum size of 100nm, which is about 1000 times less than the definition of the best current printers. The applications targeted primarily concern micromechanics, MEMS, and possibly photonics and medicine. With 550,000 meetings organised per year, PROXIMUM Group is the European leader of the B2B meeting events.